Hooray! Despite making me jump through a few hoops to verify my identity, Dabs came through and delivered my Eee 900 today. I'm posting from it right now - the keyboard will take a bit of getting used to but it's a lot easier to type on than my previous UMPC. It'd be hard to give a negative review to something I've just spent 330 quid on but it is very good so far. It's a lot better built than I'd been expecting - it may look like a toy but it's very solid. Next step - apt-get emacs and pygame. 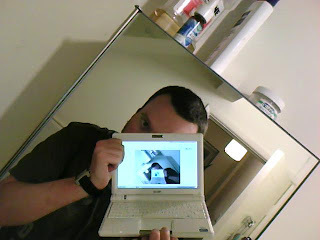 I've been playing with my digital camera, trying to make a better video for the turbo toaster. The results aren't perfect, but still better than I expected for about an hour's work. The title and fade in was done with Kdenlive, which I found really easy to use. Pity that it doesn't seem to anti-alias the text properly when fading to the video clip. I brought up the colour a bit using mencoder with a few filter options. Anyway, there you go, flying toast in full motion video. I've uploaded a few of my older posts from my wordpress installation - the LED message board modifications, the event report from Robot Wars 2003, and the Turbo toaster.